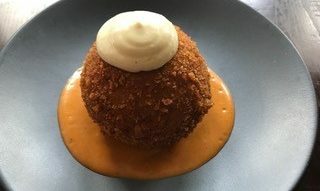 Said to be invented in Barceloneta, Spain, ‘la bomba’ is a breaded and fried ball of potatoes with a meat-filled center, served with a spicy sauce and aioli. Our friends at Bar Mercado shared this delish recipe with us. Pair this savory dish with a luscious Ribera Tempranillo. Peel potatoes and bring to boil in a pot of salted water. Pass through a potato ricer and let cool on sheet tray. In large rondo, sear ground chuck flap. Reduce heat and add shallot and garlic; cook until translucent. Season meat with pimento, salt, cumin, coriander, onion powder and black pepper; drain off fat. Place on sheet tray and cool. Combine potatoes with ground beef. Add flour and eggs; mix well to incorporate all of the flour. Add Manchego and dates; taste for seasoning. Portion into 4 oz balls. Bread using standard breading procedure; make sure to pulse panko in food processor or spice grinder. After crusting with Panko, fry until golden.